Jeff Bezos, the chief executive of Amazon and the richest man in the world, published an extraordinarily personal blog post on Thursday that accused the owner of The National Enquirer of trying to blackmail him in order to stop an investigation into how the tabloid had obtained private messages and pictures sent between him and the woman he was seeing. 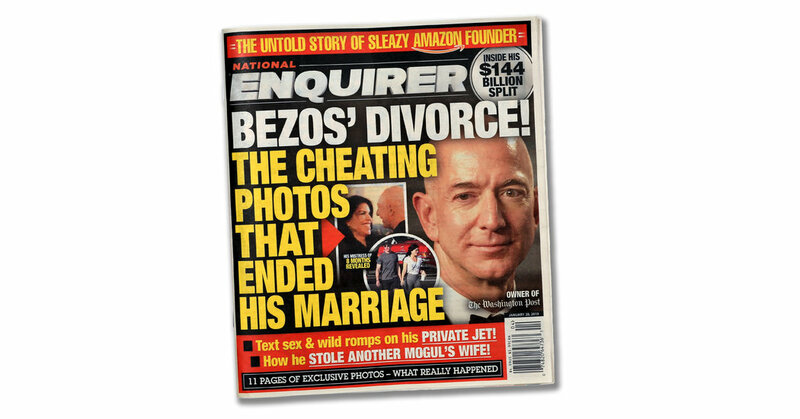 In the post, Mr. Bezos said The National Enquirer’s parent company, American Media Inc., was threatening to publish explicit pictures of him and the woman, Lauren Sanchez. He also named the chairman of A.M.I., David Pecker. The following are excerpts from the blog post. What does The Enquirer claim to have? • A full-length body selfie of Mr. Bezos wearing just a pair of tight black boxer-briefs or trunks, with his phone in his left hand — while wearing his wedding ring. • A selfie of Mr. Bezos fully clothed. • A full-length scantily clad body shot with short trunks. What does The Enquirer want? 1. A full and complete mutual release of all claims that American Media, on the one hand, and Jeff Bezos and Gavin de Becker (the “Bezos Parties”), on the other, may have against each other. 2. A public, mutually-agreed upon acknowledgment from the Bezos Parties, released through a mutually-agreeable news outlet, affirming that they have no knowledge or basis for suggesting that AM’s coverage was politically motivated or influenced by political forces, and an agreement that they will cease referring to such a possibility. Mr. Bezos alludes to another potential motivation for A.M.I.’s blackmail threat: He owns The Washington Post. The paper has investigated A.M.I. ; reports on President Trump, a longtime friend of Mr. Pecker; and employed Jamal Khashoggi, a Saudi columnist killed by operatives from Saudi Arabia, where A.M.I. does lucrative business. The Post has reported extensively on Mr. Khashoggi’s killing. It’s unavoidable that certain powerful people who experience Washington Post news coverage will wrongly conclude I am their enemy. American Media emphatically rejects any assertion that its reporting was instigated, dictated or influenced in any manner by external forces, political or otherwise. Simply put, this was and is a news story. Yet, it is our understanding that your client’s representatives, including the Washington Post, continue to pursue and to disseminate these false and spurious allegations in a manner that is injurious to American Media and its executives. Where does Mr. Bezos’ investigation fit in? Several days ago, an AMI leader advised us that Mr. Pecker is “apoplectic” about our investigation. For reasons still to be better understood, the Saudi angle seems to hit a particularly sensitive nerve. A few days after hearing about Mr. Pecker’s apoplexy, we were approached, verbally at first, with an offer. They said they had more of my text messages and photos that they would publish if we didn’t stop our investigation. What does Mr. Bezos think is at stake? Mr. Bezos said the email describing the pictures had gotten his attention, but he thought there was more at stake than his personal privacy. Any personal embarrassment AMI could cause me takes a back seat because there’s a much more important matter involved here. If in my position I can’t stand up to this kind of extortion, how many people can?